Dr. Arian Fartash, OD, creator of Glam Optometrist. 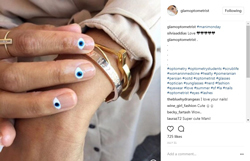 SAN FRANCISCO—In January 2016, Arian Fartash, OD, started her blog, Glam Optometrist, as a social media amateur, however, she didn’t let her lack of social media marketing skills keep her from success. In just one and a half years, she has transformed from a newbie blogger to an Instagram guru with over 16,000 followers.“At first, I started GlamOptometrist as a fashion blog,” explained Fartash. “However, I thought I could have more impact by educating the world about optometry in a fun, inspiring way instead. Posting about eye health, eye fashion and eyewear is an amazing opportunity to connect to thousands of people around the world.” Fartash’s @GlamOptometrist Instagram account features the latest frame fashion, eye-inspired accessories, eyecare facts and more, with one to two new post per day to keep her audience engaged. The Glam Optometrist blog is also updated every once in a while to expand on certain topics like contact lens health and to share photoshoots. At the beginning of her blogging career, it was difficult for Fartash to find the best way to gain followers. “When I first started, I contacted many PR agencies to help because I was not knowledgeable about social media,” she explained. Fartash’s blog allows her to go into more detail about issues such as eye health and fashion. 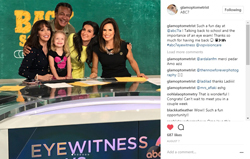 Fartash appeared on ABC7 Los Angeles to promote children’s eye health. Fartash posts about various eye-related topics on her Instagram, such as this #ManiMonday eye-inspired manicure. 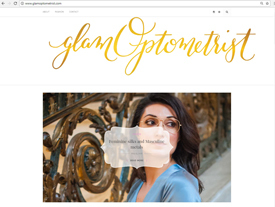 To learn more about what the Glam Optometrist does, look at her Instagram account, read her blog or watch her in one of VSP’s “Love At First Sight” videos below.